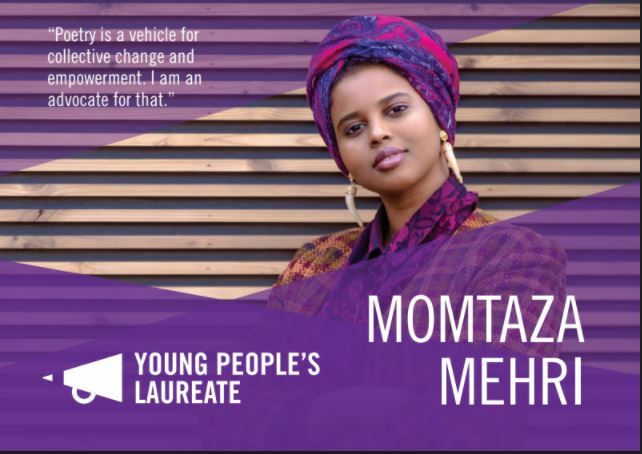 We are delighted to announce the new Young People’s Laureate for London is Momtaza Mehri. Momtaza will work with Spread the Word for a year on youth-focused residencies across the capital. The Young People’s Laureate’s mission is to raise the visibility of poetry in the capital, nationally and internationally; engage and inspire London’s young people with poetry through the issues that affect them; and support the development of London’s talented young poets in a tangible way. She will receive a range of poetry-development opportunities to assist her career progression and will front a tour in six outer London Boroughs: Barking and Dagenham, Brent, Kingston, Bromley, Redbridge and Sutton. In her role, she will also co-host a special development project for talented young London poets called The Young People’s PoetryLab. Momtaza is a poet, essayist and editor with a background in biochemical science. Her work has been featured in BuzzFeed, Vogue magazine, The Poetry Review, BBC Radio 4, Real Life Mag and San Francisco Museum of Modern Art’s Open Space. She is a Complete Works Fellow and has been shortlisted for the Brunel African Poetry Prize and the Plough Prize. She won the 2017 Out-Spoken Page Poetry Prize and was third in the 2017 National Poetry Competition. Her chapbook sugah.lump.prayer was published as part of the New Generation African Poets series, edited by Kwame Dawes and Chris Abani, in 2017. Her poems also feature in Ten: Poets of the New Generation, published by Bloodaxe Books in 2017.